​When PennDOT undertakes projects, one of the many considerations the department must take is the historic preservation of the area surrounding that project. It's something the department takes seriously, as is it committed to preserving the rich history of our state. Angie Jaillet-Wentling is a historic preservation specialist focused on archaeology. She first interned with PennDOT in 2008 and began full-time employment in 2016. She covers seven counties in southwestern — Allegheny, Beaver, Lawrence, Fayette, Washington, Greene, and Westmoreland — which encompass PennDOT Districts 11 and 12. 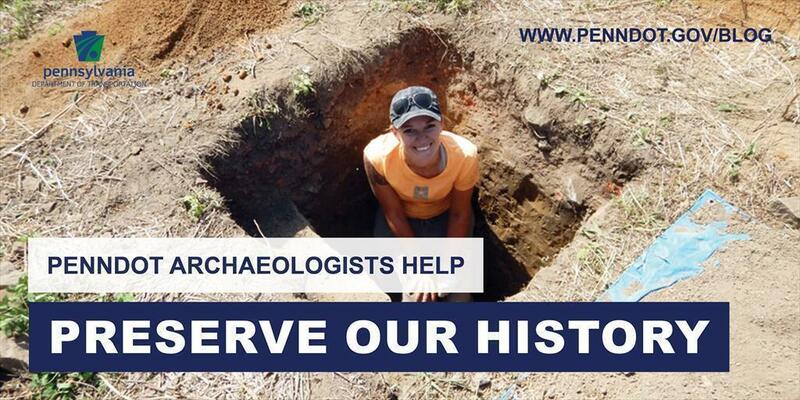 Jaillet-Wentling graduated from Penn State in 2008 with a bachelor's degree in Anthropology, and received her master's degree in applied archaeology from Indiana University of Pennsylvania in 2011. After beginning her archaeological career with PennDOT as a cultural resources intern​, she became the first field director of the PennDOT Highway Archaeological Survey Team (PHAST) program. Jaillet-Wentling has experience in pre-contact and historic-era investigations in eight states of the Mid-Atlantic and Midwest regions over the past eight years in cultural resource management. She especially enjoys public archaeology (media applications), GIS and LiDAR applications in archaeology, and the region's pre-contact, contact, and historic-era archaeology. Currently, Jaillet-Wentling holds two titles — historic preservation specialist and cultural resources professional. Delegated by the Federal Highway Administration, she helps guide the implementation of PennDOT's cultural resources program and the ways in which the individual engineering districts navigate Section 106 of the National Historic Preservation Act process and how it may affect the overarching National Environmental Policy Act process. On a more localized level, she works as one part of a team, which includes her covering below-ground cultural resources, and her counterpart, an architectural historian, covering the above-ground cultural resources realm. Together, they attend design field views early in the project planning process, provide guidance as to what studies may be needed (sometimes performing those studies themselves), and ensure that each project follows the process in the most efficient way possible. They're responsible for Findings of Effect or the determination of whether a project's activities will affect cultural resources and, if so, how PennDOT can mitigate for that impact. Jaillet-Wentling says she considers her greatest accomplishment at PennDOT as building on and developing working relationships with other federal and state agencies to the benefit of the tax-paying public. "I love developing public outreach and education components to mitigation efforts and conducting my own fieldwork — on sunny days!" she said. She also credits some of her success to Joe Baker, a historic preservation specialist in PennDOT's central Harrisburg office. "I have a lot of mentors and peers that I look to for advice in the Cultural Resources Unit, but the one that has been mentoring me the longest and is a bit of a driving force behind all of his interns — past and present — is Mr. Joe Baker," she explained. "Joe's internship program went above and beyond, providing guidance, discussion of issues, and experience for the original central office internship program and PHAST." Jaillet-Wentling has a big family concentrated in northwestern Pennsylvania, but lives and works in in the southwestern part of the state where her husband, Rich, is a doctoral student in criminology and professor at IUP. Together they are raising an energetic young astronaut/fireman/superhero/builder — their 5-year-old son, Aiden. She spends most of her time in the outdoors with her family, friends, and pets. Her favorite activities include gardening, refinishing furniture, hiking, running, biking, kayaking, fishing, and reading. She loves volunteering with Team Rubicon, a disaster relief group of veterans and first responders.